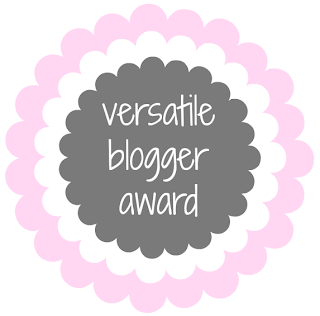 "I nominated you for the Versatile Blogger Award! :)"
The what award now? And do I know you? I was pleased when I visited the commenter, Kaitlin's blog to read all about it. I'd only come across her blog recently, but clearly re•solve had left an impression on her, and it was one I was proud of. Sure, I always get a little surge of happiness when someone in blog land tags me for a liebster or other chain, but let's be honest: you're almost always nominated by someone in your blog "clique." You've come to like the person as much, if not more, than the blog itself. "This award is given to you by your fellow bloggers for having quality material such as good quality photos and uniqueness of subjects covered. The award is to honor the bloggers who bring something special into your life!" I talk about many things on re•solve, and this award states that I've done it without looking like an incoherent mess. I've done it in away that readers understand all my content, regardless of topic, points back to one central theme of who I am. So yay! I'm going to take a genius cue from Holly who was also a Sunshine Award recipent! I want to get to know all of my readers (especially you lurkers who read and stay silent)! So, I'm inviting everyone to participate in a more simplistic fashion; leave a comment with a random fact about yourself below! I started making my own laundry detergent at least a year ago. My laundry and personal care products are all DIY and/or safe, but I've yet to switch my dish detergent! That may have to be next year's re•solve. My husband and I often (unintentionally) dress alike when going somewhere together - usually church. I always get excited when meeting another vegetarian - but I secretly get annoyed if they start talking about how good fake meat is. I just don't get the fake meat thing. I used to love purple - too much. I detest it to the point that I won't touch anything purple. Here in Maryland, it makes the Ravens fans sad. I am obsessed with Margherita pizza and pretty much anything of the Caprese variety. I'm glad this is my last fact. I always think of fun facts on the random but forget what they are by the time I need to provide them. Also I'm glad because 7 is a favorite number of mine - and my man's is 8! I think it is adorable that you unintentionally dress alike. I am going to pay attention and see if my boyfriend and I ever do that! I'm visiting from DYWW. Congrats on the award! Your interesting fact #3 is hilarious. I laugh about this all the time, because I just don't get it! Ha, thanks! It's not for everyone, that's for sure! Number 5 & 3. Yes yes yes ma'am. I love that pizza and don't get number three at all. I don't understand why someone would want to eat a fake version of something they don't like or think I'd wrong.